As I watched the opening ceremony of the Paralympic Games, I realised that as I have gotten older, some of my points of view that I had thought were sound, are not. In fact many of the views I hold are stereotypes and that really saddens me. It has been quite a shock to realise that I do have short-comings in my understanding of disabilities and this has made me feel very uncomfortable. The ceremony was wonderful. Breath- taking and very, very thought provoking. I have been an advocate for equalities all my adult life. For heaven's sake, I was a head teacher for over 13 years with the power to influence many young minds. I have spoken on many occasions to a school assembly about the differences we all have and how they are what makes us all special. And yet during the ceremony I was in a very unsettling space. I will be challenged and changed. Will you? My sister was severely disabled in her teenage years. She had a horrible disease and it made me sick and sad to watch people mock her and imitate her actions. Sadly, being uncomfortable in situations makes so many people cruel. I always think, ‘At the end of the day anyone can overcome almost anything except bias and intolerance’. This was really thought provoking. Bravo for all those that try when it’s not just easy! I suppose we all have disabilities (as well as abilities), but these lie in different areas. Some are more visible than others. It is trying to not see those we can see and trying to see those we can’t I suppose! Why were you so unsettled? I had a friend who lost a leg to cancer in middle school. She went on to become a special olympics medalist in both downhill skiing and swimming! You are lucky to have experience of such a disability and a special, talented friend. A man my son works with is participating in the Paralympics in power lifting. He has a withered leg from having had polio. nice to hear that the Paralympic games were in London, around the same time as the other Olympics. They follow the Olympics each time! There will be a Paralympics in Rio in 2016! I have heard this from others, and I wish I had watched them. great post. We all need to be challenged in our thinking from time to time! Provocative post. Reminds me how this is one of my glaring shortcomings, an ability to get my head around disabilities of any kind. Sorry I missed the ceremonies, and thank you for reawakening an important question. Thank you so much for your supportive comments. I’m glad you enjoyed the thinking! Wonderful post, Julia. Congratulations o being Freshly Pressed! That was an amazing and enlightening post. I love how those revelations happen and they just shock us, but are welcomed because we realize we are growing. I have had many of those lately and I loved reading yours. Thanks for sharing. Many thanks for sharing your thoughts too! 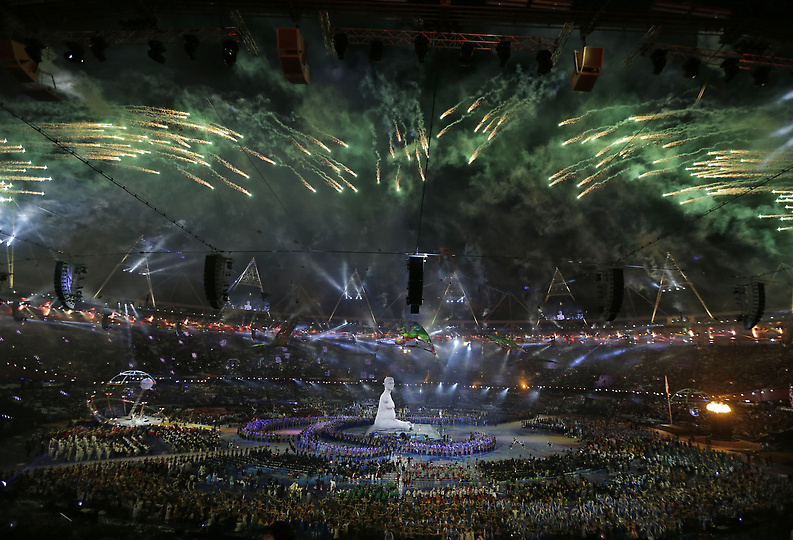 I wonder if the Closing Ceremony can surpass it? Reading your post reminded me of my days in college. There was a beautiful mural that showed well known faces of people with “disabilities”…everyone from Frida Khalo to Einstein. Both had serious challanges (Khalo’s physical disabilities and Einsteins dyslexia) but because they were so huge in their accomplishments, I had forgotten that they had such serious challages. Looking up at that mural on days I felt down was more inspiring to me than all the times I saw an “A” on my tests in college. Im so glad I read this post and hope my son who falls on the autism spectrum fulfills all the dreams that fill his heart. That’s what life should be about isn’t it – fulfilling potential! Although I’m not big into watching any of the Olympics, I related to not realizing I’ve held various sterotypes. When I’ve become aware of this, it’s shocking to me as well. Thank you for the reminder to reconsider my ideas and thoughts…on the off chance it’s a stereotype and not actually an opinion. I’m sure it is the stereotype! I am training for my 2 nd marathon this year, raising funds for the Leukemia Society of Canada. I was just saying to my husband that I will need a new challenge when this is done. I feel my life is so easy that I need pain and struggle and challenge to make me feel alive and to make me realize how tough others actually live. Thanks for your post. I know what you mean too about stereotypes and the way I used to think. Well done for ‘getting in there’! A lovely post – we could all learn from your sentiment about challenging our attitudes to disability, attitudes which do sometimes seem to sneak up on us without us noticing them. If the Paralympic Games have done anything for me, they’ve let me watch compelling athletic competition in which the athletes just happen to have physical challenges over and above those of able-bodied. And isn’t it brilliant to see full stadiums and venues for these games? This definitely isn’t a ‘poor relation’ to the Olympics. Not by a long chalk. I have not been aware of the disabilities as I get into the sports. Just goes to show! Reblogged this on Crayons . Well said. Well written. Bravo, Julia! Just as beautiful as your new found insight into disability is your admission of personal shortcoming. This is something to be proud of when your reaction is to rectify it. I sometimes look at my life as a process of first learning and mastering the misconceptions, assumptions, and stereotypes around me, and now destroying them as I realize myself looking through them at a distorted world. I find myself being more amazed at things around me as this happens. The world is ripe with possibility for me in a way it hasn’t been since before I learned all of this lazy thinking. This is a beautifully honest post. I admire your self-reflection! An eye opener. What a beautiful, honest piece. I really enjoyed reading this Julia and felt very similarly about David Toole’s dance. I was a SEN teacher for many years and have supported individuals with a variety of challenges but still never feel confident that I say the right thing or behave appropriately when they are not my students. Going to watch wheelchair basketball tonight. Very excited and a little nervous. Anyway, great post! Thanks! Many thanks for your comment. We’re off to the athletics tomorrow & like you will be a little nervous! You took the words out of my mouth. A very challenging opening ceremony and it does make you think – we only know what we see and we should see so much, much more. I think that was the idea of the producers. Let’s hope it becomes part of the ‘legacy’ conversation! There is a fantastic podcast on iTunes called “Ouch, the Disability Podcast.” It’s fantastic listening, both entertaining and thought-provoking. I started listening to it when I got a job nannying a child with cerebral palsy because I thought it might help me understand his needs more and now I just listen for fun. I enjoy it because I’ve always though people are just people, and everyone has some sort of physical, emotional or mental issue and we are all equal because we are all human with different human experiences. This podcast really puts that point out there. I highly recommend it! Thank you for taking the time to comment. I know what you mean but the ‘other’ Olympics were no where near as bad as the premier league football! I love this post as I have several friends with a disability. We spend a fair amount of time talking about how disability and the disabled are portrayed in the media, the superlative cliches that abound and how there is this pressure on people with a disability to be imspirational. That paralympics are a fantastic celebration of athleticism, the athletes are there to do a job and that’s what we should applaud, that craft, just as we would any other athlete. Thank you so much for stopping by. You are very lucky to have the opportunity to learn about disability from experts! I think we all have preconceptions and stereotypes about certain groups of people and individuals, but for me, it’s about being aware of this for yourself and like you say, allowing yourself to change your ideas and acknowledge that your knowledge about certain abilities or cultures is lacking. You’ve said before in previous posts, we are all learning every day. This is just another example of learning and gaining experience. This is a lovely post Julia. I think many of us have our perceptions challenged when we see what the disabled can and do do. The dexterity shown by silver medal winning Mexican swimmer Arnulfo Castorena as he propelled himself one armed poolside yesterday made me gape. I couldn’t imagine myself being anywhere near as skilful. Be glad that we live in a society where those with disability are visible. In the past, few amputees or wheelchair users were out and about in our streets. Next stop, mental illness awareness. I couldn’t have written it better, Julia and applaud you for stating what I have shied away from thinking. I worked as a carer for some time yet still am not comfortable with disability, much to my shame. I watched the ceremony, sometimes with disbelief. I, too, need to change. I have had several conversations about this and the general consensus is that it is our experience that restricts us. So, I want our disabled to be taken out the boxes we’ve put them in so we do feel uncomfortable because it is the norm. They certainly are but we need to make sure we don’t make them more ‘special’ than they want to. Thank you so much for sharing. This, so much. While I believe there is still so much ignorance out there about deafness, I HATE being given special treatment or being singled out because of my hearing. Just, talk to me normally, and everything will be fine.